AKC Registration is your proof that the puppy you are buying is a purebred dog. It is a starting place for all puppy buyers who want a purebred dog. A purebred dog is eligible for AKC registration if its litter has been registered. 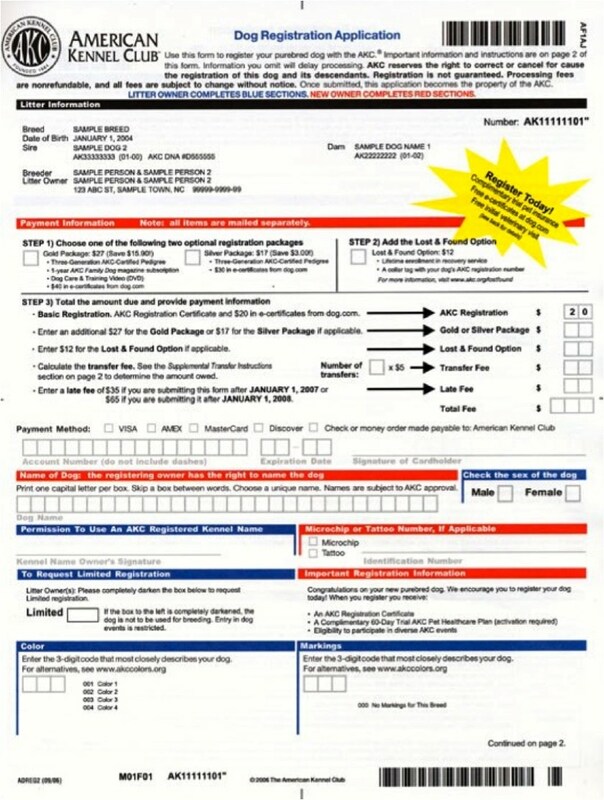 When you purchase a dog said to be AKC-registrable or comes with "papers" you should get an individual Dog Registration Application from the seller. Once the application has been completed, you should submit it to the AKC with the proper fee. The application below is a sample of the American Kennel Club (AKC) Registration Application. The AKC issues these applications when an AKC breeder registers a litter. Puppy buyers should get their copy of this application when they buy a puppy or when they fulfill contract obligations to spay/neuter the puppy that hasn’t been individually registered with the AKC. 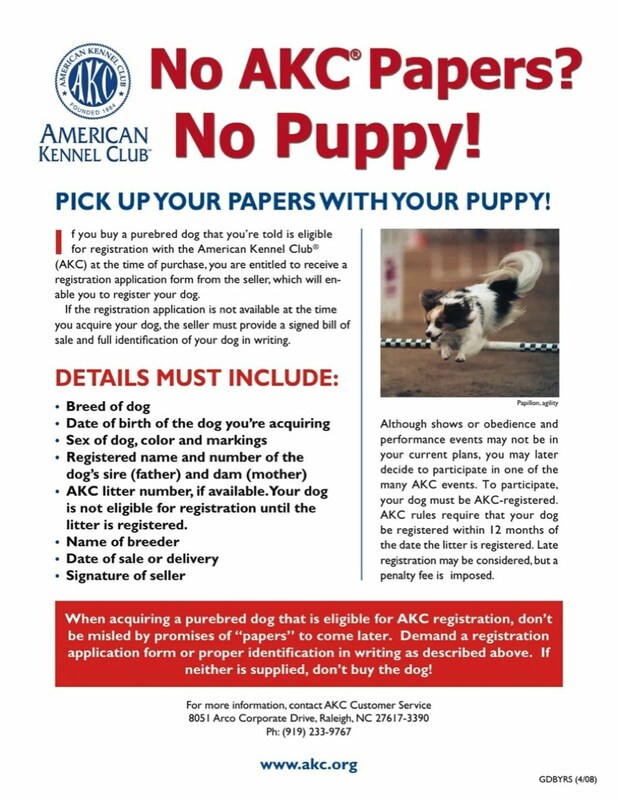 If you are interested in purchasing a puppy from anyone insist on seeing the AKC registration application before paying or contracting to buy the puppy. The certificate below is a sample of the American Kennel Club (AKC) Registration Certificates. The AKC issues these certificates when a breeder or buyer registers a specific individual dog. Puppy buyers should get their copy of this certificate when they buy an individually registered puppy or when they fulfill contract obligations to spay/neuter the puppy. If you are interested in purchasing a registered puppy from anyone insist on seeing the AKC certificate before paying or contracting to buy the puppy. If the breeder is an AKC Breeder of Merit both the certificate (see below) and the application will bear the official AKC Breeder of Merit logo. We at Woebgon Bassets are proud to be AKC Breeders of Merit for Basset Hounds at the Bronze Level. See examples of PAPERS below. Those who purchase a basset hound from us receive the registration application and a check made out to the AKC for the fee plus the stamped envelope to mail it in. We want all our dogs to be fully registered with the AKC. You need to be aware that there many unscrupolas people on the Internet today posing as breeders and take money from unsuspecting people with no intent to send them a puppy. Others simply want your money. They could care less what happens to your puppy once they have your money. Please check out our page on Responsible Breeders before you even start contacting breeders. Please also download the RED FLAG WARNING TO PUPPY BUYERS document. This list of DANGERS in finding a puppy was composed with the assistance of a group of independent Responsible Basset Hound breders on the Facebook Basset Basics Page.